People of Ecuador honor their national flag and annually observe National Flag Day on September 26. This observance has no public status, but at the same time it's a very important memorial day for the nation of Ecuador. Celebration of National Flag Day in Ecuador is connected with adoption of the flag back in 1860. Previously territory of Ecuador had been conquered by Spain and it's administration lasted till 1809, when the first calls to independence were made. The rebels rose a plain red flag, but in 1820 a blue and white bicolor with five horizontal stripes and three stars was adopted. This first national flag was changed in 1822, making it white and its first quarter blue with a centered white star. Then it was changed by a tricolor (yellow, blue and red) and again by a bicolor (white and blue). The last reinstatement of the flag of Ecuador was made on September 26, 1860. The design of the flag was finalized in 1990, adding a coat of arms. 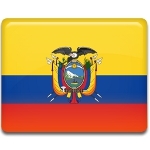 Nowadays September 26 is a national flag day in Ecuador. The colors of national flag of Ecuador have their own meaning. Yellow stands for corps and fertile soil, blue is for oceans and clear skies and red means blood shed by heroes, who died protecting their country.